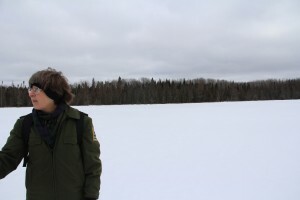 With winter coming to a close, or so some of us hope, the bog has gone through many changes and Susan Olian, Assistant Park Manager, has noticed an unusual warmth in February. Olian led a small group of 2 people out to the bog walk on Saturday, February 20. She talked about the many different types of trees that live within the bog. Some of the trees can thrive in as cold as -128 degrees. Susan Olian leads the way out onto the Big Bog Lake. In 2007, it was predicted global warming would cause Lake Bemidji State Park to have Wisconsin winters and Kansas summers Olian said. This not only effects the trees and shrubs of the bog but also the habitats that thrive there. Olian wondered if some trees will start to dwindle due to the rise in temperatures over the years. In return, the prairies will take over. She then brought up the idea of extending the bog from the Big Bog Lake to the Little Bog Lake. 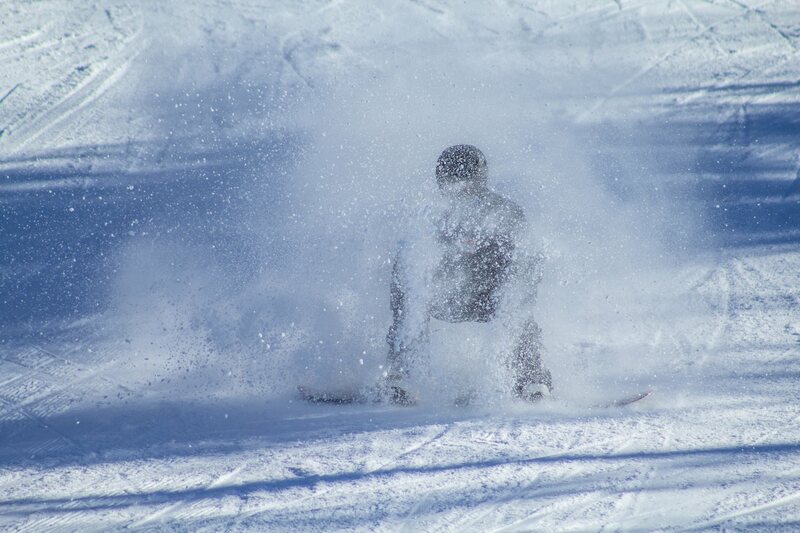 The wintertime attracts all ages who are willing to embrace the cold. 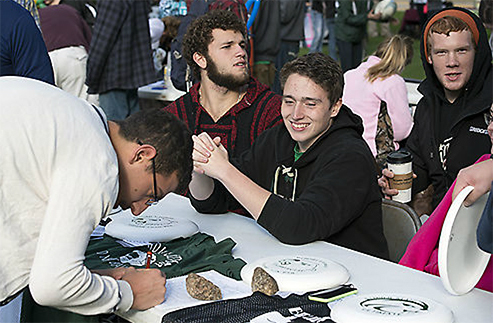 It serves as a chance to get fresh air and exercise while learning about our state parks. When it comes to winter, you have to be prepared to bundle up. Some people tend to overdress. But often individuals are not sure how warm or cold they will get until they venture out on the trails with their snowshoes or skis. The current landscape of the park is the result of the last stage of glaciation in Minn.
Olian said the bog is not a true or complete bog but “bogish in nature.” It has a lake right by it that has a field of peat, deposit of dead plant material, that causes a buildup of oxygen. Yet like other bogs such as the Big Bog in Waskish, Minnesota, it is high in acidity and has freshwater running through it. 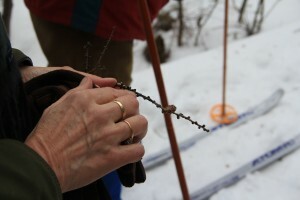 Susan Olian finds a “Tamarack rose” forming on a pine needle she found on the ground, while snowshoeing through the bog. This is also known as a Tamarack cone that has been shape as a rose. Throughout the year, fifty species of mammals and two hundred types of birds can be seen. During the winter, the park is open from 8 am-4:30 pm. 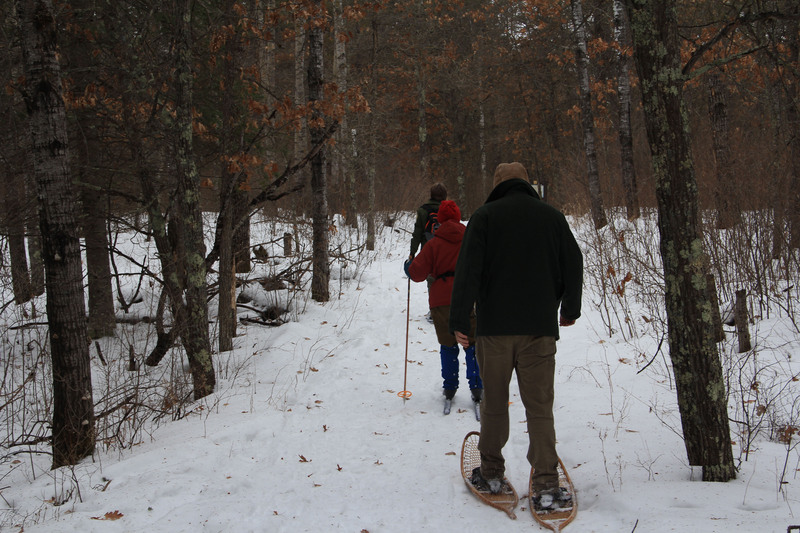 They offer snowshoe rentals for six dollars and vehicle day passes for five dollars, or a year pass for any park within the state of Minnesota for twenty-five dollars.